Get messy in our Art Room! Explore a variety of art supplies from paint to glue to coloring tools. Enhance skills such as cutting, gluing, spatial awareness, and following directions. Enjoy your favorite children’s stories read in Spanish and English. The program is suitable for native speakers and those seeking exposure to a new language. Get messy and create something in our Clay Corner! Children foster hand-eye coordination and fine motor skills by rolling, squishing, and building with clay! Make edible art using fruits and other foods donated by our local Trader Joe’s. Create a tasty masterpiece that looks and tastes good! Sign-up required. Please call or sign up at the front desk! Bust a move, sing a tune, read poetry, do whatever your heart desires – it’s your time to shine! Foster creative expression and build confidence in children of all ages. Hosted by Mamabee Nutrition at SCCM, Postnatal Mama and Baby yoga is a fun, supportive space for you to honor your rebirth as Mother. The practice will focus on the physical and energetic connection with Baby and to Mama’s own intuition. This class is appropriate for all levels. 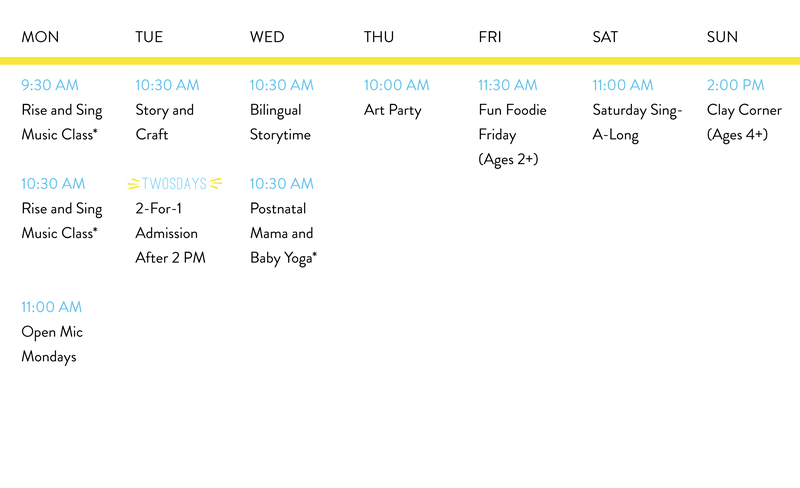 Babies newborn through 14 months are welcome to accompany Mama to the class! There is even a DockATot™ available to keep your little one comfy during class (limited number available)! $17/drop-in or $95/8-class series. First class is FREE! *Limited spots available. Pre-Registration with the front desk is recommended. Bring yoga mat, water, & towel. Hosted by Rise and Sing at SCCM, this class is designed for children and their parent/caregiver to participate together in active music making and play. Music activities are designed to support fine and gross motor skills, language and communication, early academic concepts, social skills, and self-esteem. Participants will play instruments like bells, maracas, and drums, sing along with familiar tunes, learn new songs and finger plays, engage in musical story time, shake the parachute, play with puppets and other props, and march, jump, clap and dance along to live music, all while strengthening the bonds between caregiver and child. Winter session runs January 7 – March 11 (no classes on Jan. 21 and Feb. 18). $160/8-class series (siblings under one are welcome to attend at no charge). 100% interactive music time! Children learn rhymes of all kinds, sing silly songs, and are encouraged to wiggle and move! Listen to stories featuring illustrations from our Artist of the Month, then get creative and make a craft to take home. Classes listed with an asterisk (*) require registration and a separate programming fee. All other classes are FREE with admission. Events are open to children of all ages unless otherwise specified. Schedule subject to change.